Who's in Charge in this Garden? I have to ask myself, just who is in charge in my garden? 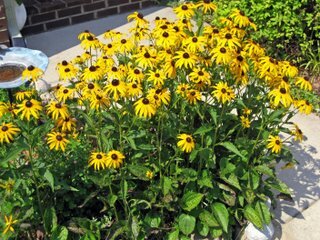 These Black-eyed Susan’s (Rudbeckia hirta) are growing by the front walk. Once again, like the bee balm in my previous post, I didn’t plant them there. They chose their spot, and there they are, providing a bright display on a hot, summer day. I'm pretty sure if I were actually in charge, I wouldn't have thought to plant these in this spot. But now that they are there, I think they look nice, so I'm leaving them alone. This provides further proof that I am not really in charge of my own garden. So, if I’m not in charge, just who or what is? I know I’m not in charge of the corn and what it does or doesn’t do. It still steadfastly refuses to form ears. I have lots of tassels, covered with pollen, but just one little ear. And, near as I can tell, there’s not much I can do about it at this point. The corn is clearly in charge of itself! And, it’s maddening! I did put myself in charge of weeding and harvesting and fertilizing this morning. The results of my labors: bell peppers, Anaheim peppers, banana peppers, lots of green beans, one more zucchini squash and many little cucumbers. Plus, I have a clean and tidy (more or less) vegetable garden, watered and fertilized and hopefully working on producing more vegetables for me to harvest in a few more days. 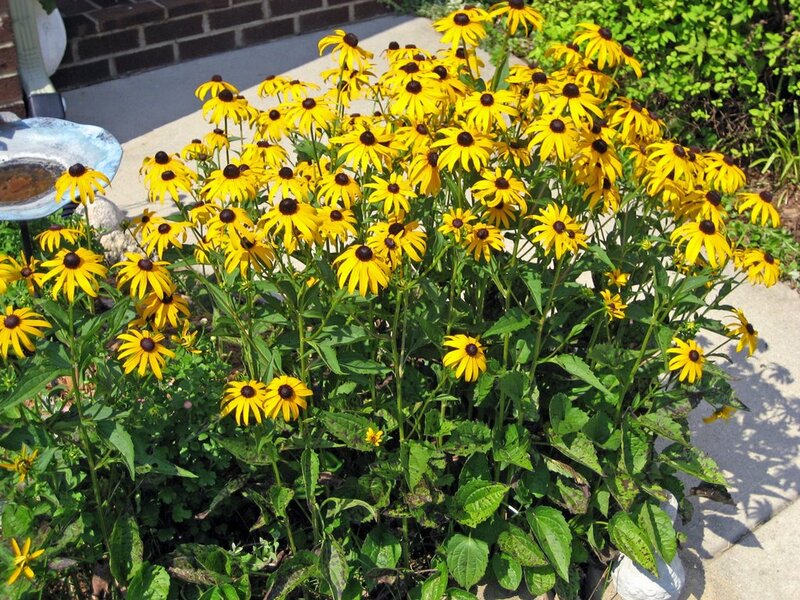 Accept the black eyed susans and Bee balm as plants supplied to you from the garden.Serendipity, the best plants to have.They look beautiful.